This 59 year old male presents to his urologist with a mass in his testicle. Examination reveals a nodular mass in the epididymis that is tender to palpation. The patient was taken to surgery and the epididymis removed and submitted for frozen section diagnosis. 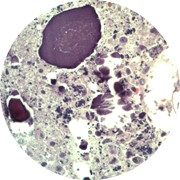 The nodular area was composed of pigment laden macrophages, calcifications, mixed inflammatory cells and ill formed granulomas along with giant cells with engulfed sperm heads. This is a spermatic granuloma presenting as an epididymal nodule.